Korri and I flew to Seattle for the day to attend the home opener of the Seattle Seahawks! After landing, we caught the light rail heading northbound into Seattle along with a shockingly (to me) large number of people wearing Seahawks and Cowboys jerseys. It was about 9:30 in the morning and everyone was already on their way to the stadium! The game didn’t start until about 1:30 pm. 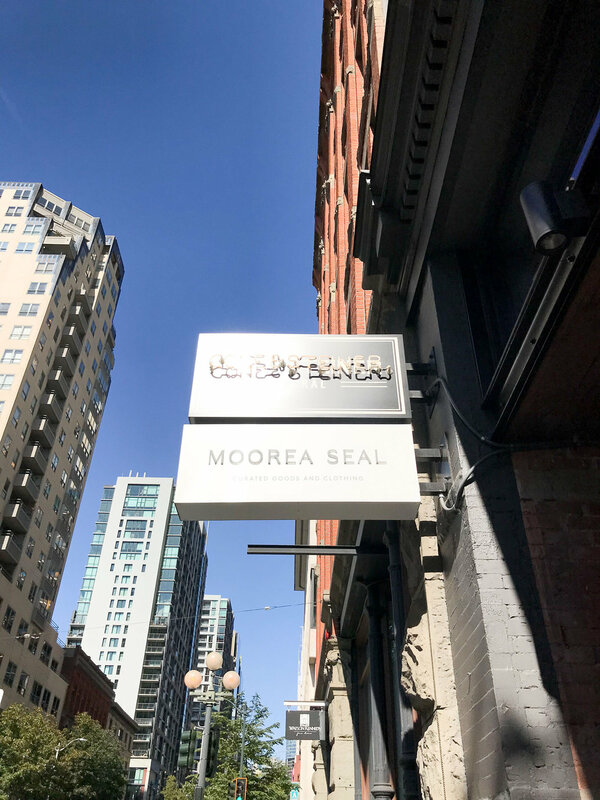 After brunch, we walked a couple of blocks down to the Moorea Seal retail store. I’ve followed Moorea for years now on Instagram, ordered a number of items from her website, and was thrilled to finally be visiting her storefront! Unfortunately I did not buy anything because I had no way of getting it back to Boise (I only had my clear stadium bag with me for the game, and it was stuffed with some small gifts from my mom and our DSLR camera that I didn’t end up using at all, haha). I’ve got my eyes on these zodiac stud earrings, though. My parents joined us on the few-block walk over to the stadium. There was a mass exodus of people in jerseys and other Seahawks gear walking down to the stadium at the same time and yelling random chants along the way. We passed a blogger at one point—I could tell by the photographer waiting on the sidewalk for people to stop walking by and the lady sitting at a table in the corner on a restaurant patio. No idea who she was, though! I’m sure Seattle has a ton of bloggers. We didn’t convince my parents to stay for the game, so we parted ways after wandering around the outside of the stadium. It was a madhouse, as you probably could imagine! Once inside the stadium, we made our way to the Seahawks store and browsed but didn’t end up buying anything even though I was eyeing the baseball caps. That was maybe a bad idea because our seats faced southwest and we were in the sun the entire game. We all got slightly sunburned, but I took off my vest and held it over my face most of the game to prevent it as much as possible. I can’t complain too much, though—the weather was absolutely gorgeous that day! We met the rest of our group at our seats; some of Korri’s friends from Boise also made the trip over. We sat in the section right below where the opposing team’s owner sits, and since the Seahawks were playing the Cowboys, we were right below Jerry Jones. Everyone in our section was yelling and waving at Jerry and he even waved back, haha. The best part was when everyone waved goodbye when he left. The Seahawks ended up winning, which I was very happy about since it was my birthday, after all. ;) Plus, I didn’t want Korri to be in a bad mood during our trip home, haha! They scored one touchdown on the end zone closest to us, and I caught it on video (see it on my Insta stories highlights). The guys all around us would high five everyone anytime something good happened during the game, and the guy in front of us high-fived my phone after that touchdown. It made me laugh! We had to head back to the airport immediately after the game. Pro tip: Walk north to Pioneer Square station if you’re planning to catch the light rail heading south after a big event at one of the stadiums. The stations closest to the stadiums were absolutely packed full of people trying to get on. Once in the airport, I had time to grab a few of the most delicious snacks that I’ve only been able to find in the Seattle airport: Biena milk chocolate-covered chickpea snacks. YUM!!! I actually might order them on Amazon in bulk since they’re a lot cheaper on there than they were in the airport…not surprisingly! I had a wonderful time celebrating my 29th birthday! 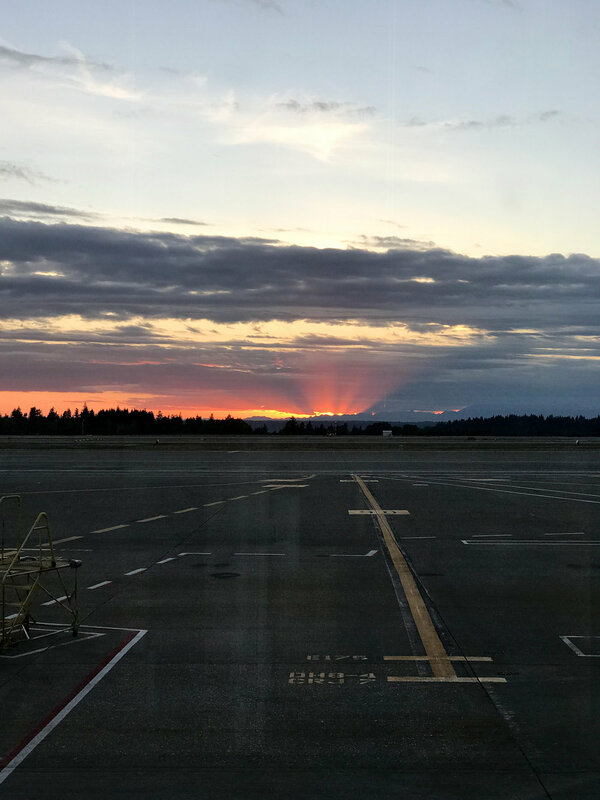 :) We watched the sun rise on our flight to Spokane and set as we were leaving Seattle. Until next time! P.S. I wore the Earth ‘Vital’ sneakers ALL DAY and my feet did not hurt at all by the end!